Two killed in violent clashes between pro-Islamist protesters and police in Egypt's coastal city of Alexandria. Two people were killed in violent clashes that erupted late on Wednesday between pro-Islamist protesters and police in Egypt's coastal city of Alexandria, Reuters reported. The Egyptian Interior Ministry said the clashes happened during two marches organized by some 200 members of the Muslim Brotherhood in Alexandria. "They (the Brotherhood protesters) blocked the road... set shops on fire, burned a citizen's car, fired guns and bird shot and clashed with and terrorized the people," the ministry said in a statement quoted by Reuters. It said some residents had exchanged fire with the Brotherhood protesters, killing two people and injured three police officers. The police forces managed to end the clashes and arrested 10, according to the Interior Ministry statement. The clashes in Alexandria took place hours after Egyptian officials fired tear gas and water cannons at a student demonstration in Cairo. Egyptian state media reported that about 300 pro-Brotherhood students blocked a road near the Defense Ministry, chanting anti-police and anti-government slogans. When the protesters refused to move, anti-rioting tactics were used, officials say - including tear gas and water cannons. Students supporting ousted Islamist President Mohammed Morsi have been staging daily protests inside and outside their universities since the start of a new academic year in September. At least 10 students have been killed during clashes with the police. In November, Egypt's army-installed interim government issued a law that banned protests near or originating from places of worship and made it compulsory to seek Interior Ministry permission to hold a demonstration. Since the law was passed, hundreds of Brotherhood protesters and liberal activists have been arrested for demonstrating without permission. The already tense situation in Egypt has deteriorated in the past week, since the Egyptian government declared the Muslim Brotherhood a terror organization, sparking new tensions between the military and the Brotherhood's supporters. The government has been engaging in a wide-ranging crackdown on Brotherhood members and supporters. 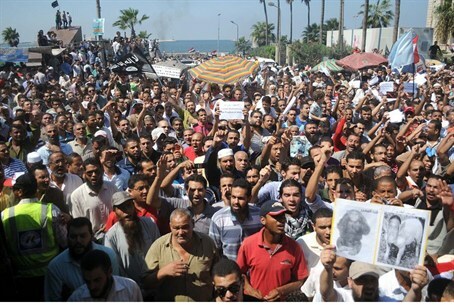 On Tuesday, Egyptian officials seized the assets of at least 500 Brotherhood leaders. On Monday, 3 Al-Jazeera journalists were arrested on charges of meeting with Brotherhood officials.